is a passerine bird belonging to the bunting and American sparrow family (Emberizidae), a group most modern authors separate from the true finches (Fringillidae). This is a small bunting, measuring only 12–14 cm (4.7–5.5 in) in length. It has a heavily streaked brown back and white underparts with fine dark streaking. 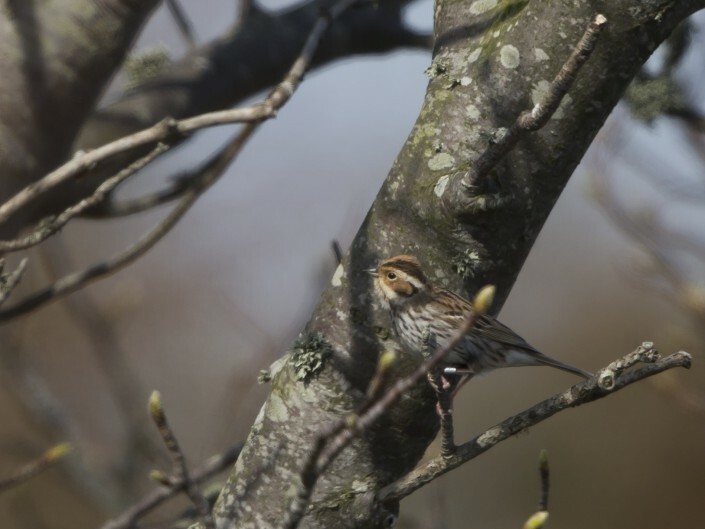 With its chestnut face and white malar stripe, it resembles a small female reed bunting, but has black crown stripes, a white eye-ring, and a fine dark border to the rear of its chestnut cheeks. The sexes are similar.